WK Interact is one of my favorite street artist, and here he is going big yet again! 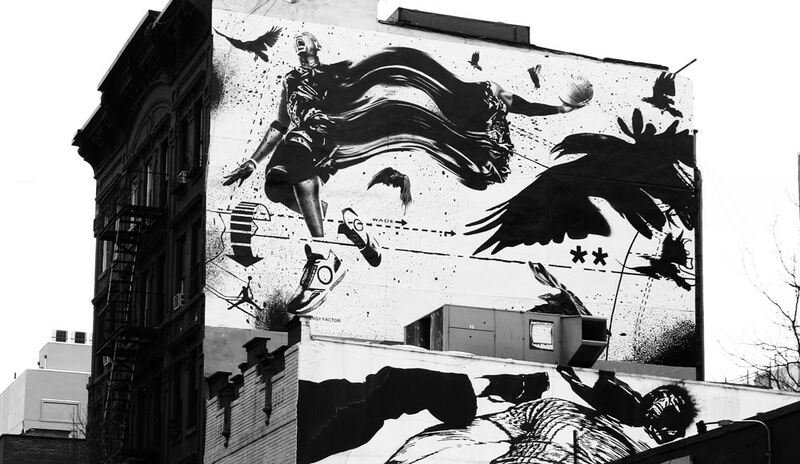 His distinct style is characterized by graphics that are infused with a sense of motion, a beautifully balanced tension that is created between precisely composed figures and the dispersed chaos of splattered paint that drips down the walls he graces and the powerful contrast created when working in strictly black & white. I am a huge fan of his theme comprised of athletes in motion, not to mention the beautiful air Jordan logo he masterfully crafts with a couple strokes of a brush! He is such an intelligent, successful, and well spoken artist who continues to bring it to the streets, mad props. Check out his site HERE. Keep an eye on WK Interact, he’s not stopping anytime soon.